The Explorers Burke and Wills and their Searchers. In regard to explorers routes, an examination of existing records has been carried out and no responsibility for their correctness can be taken by the Department of Natural Resources. The Cloncurry Shire Council accepts full responsibility for the information shown on this map. Sunmap is the mapping arm of the Queensland Department of Natural Resources and Water, (formerly the Department of Lands (Division of Information); Department of Lands (Department of Geographic Information); Department of Mapping and Surveying). 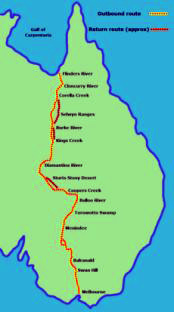 In 1999 in collaboration with Cloncurry Shire Council they produce a map showing the tacks of Howitt, McKinlay, Landsborough and Walker through Queensland. The track of Burke and Wills was represented by Alfred Cory Towner's 1952 retracing of their route, which he did in a LandRover. Sunmap / Department of Natural Resources (Queensland). Wikipedia, the online encyclopedia, has had a Burke and Wills page since August 2003. The page was started by Wikimedia Foundation employee, Tim Starling of Melbourne. The page has since been edited over 200 times (averaging one edit a week). There are now seperate pages for Robert O'Hara Burke, William John Wills, John King and The Burke and Wills Expedition. 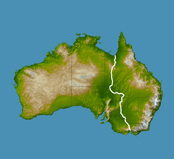 In October 2005, Cfitzart, an art student from Canberra added a map of the Expedition's route based on the map in A Successful Exploration of Australia by W J Wills. Dave Phoenix of Burke & Wills Web has contributed extensively to the Wikipedia pages relating to the Expedition. In 2006 he modified Cfitzart's map to more accurately reflect the track of the expedition. Paul Dorsey is a British born, Canadian journalist living in Thailand. Using GoogleEarth's satellite imagery he has compiled the first ever .kmz map of Burke and Wills track. Paul used Wills' and Howitt's latitudes and longitudes to plot the placemarks. This means the accuracy varies throughout the map just as Wills' and Howitt's observations varied in accuracy. Paul, who has never been to Australia, aknowledges this variation and relies on the illustrative value of the project to make a highly entertaining tour across Australia. Dave Phoenix's Burke and Wills Walk, 2007. This NASA LandSat7 composite satellite image of Australia has been overlaid with the northbound track of the lead party of the Victorian Exploring Expedition. The track was determined using Wills field-books as part of the preparation for Dave Phoenix's Burke and Wills Walk across Australia in 2008. This image is © Dave Phoenix, 2007. Dave Phoenix's Burke and Wills Walk, 2009. This NASA Jet Propulsion Lab satellite image photo-composite Number PIA06665 was captured as part of the Space Shuttles SRTM mission. It has been overlaid with an updated version of the northbound track of the lead party of the Victorian Exploring Expedition based on data collected during Dave Phoenix's Burke and Wills Walk across Australia in 2008. This image is © Dave Phoenix, 2009. Dave Phoenix, Greater Bendigo Shire Council, 2010. 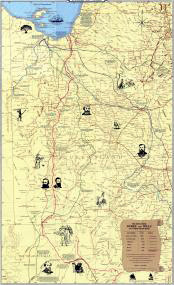 This map of the expedition's track in Victoria was prepared for a brochure produced by Greater Bendigo Shire Council for the 150th Anniversary of the Burke and Wills Expedition, August 2010. This image is © Dave Phoenix, 2010. Dave Phoenix, Fairfax Media, 2010. 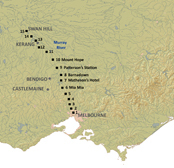 This map of the expedition's track was prepared for an educational supplement about the 150th Anniversary of the Burke and Wills Expedition and was published in The Age [Melbourne] in July 2010 and The Bendigo Advertiser in August 2010. Dave Phoenix, Landmark Magazine, 2010. This map of the expedition's track was prepared for an article on the 150th Anniversary of the Burke and Wills Expedition published in the October 2010 edition of Landmark Magazine.